When it comes to education, a simple hands-on activity can make a lifelong impact. This is exactly what is happening at Weaverville Primary School. Educators are working together on a project that is teaching their students many lessons they will never forget. Even with persuasive papers written, research done, a commercial made, and a yard sale held, the learning and fun is just beginning. 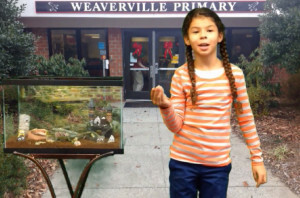 For about two months now the students in Mr. Powell’s first grade classroom at Weaverville Primary School have been trying to get a class pet. It all started with a simple classroom assignment to write a persuasive paper to Mr. Powell explaining why they should or should not get a pet for their classroom. With only one student arguing against a classroom pet and some very persuasive reasons, ranging from educational value to just the joy of taking care of another living thing, the students convinced their teacher that a pet would be good for the classroom. That was the easy part. They next researched what would be a good class pet and what cost would be involved in the care and feeding of a class pet. During their research a parent discovered petsintheclassroom.org. The class looked into the grants and what was involved and what would be the best for them. They took a vote and decided that a leopard gecko would be the way to go. They quickly received the grant and after the celebration died down they did some very grown up math to determine the total amount they would need to provide a safe and secure home for their new friend. The grant covered most but not all of the cost of the things they would need for the gecko so they decided to have a yard sale to raise the rest of the funds needed and to work for what they wanted. With much excitement and enthusiasm there was no assignment related to this task that the students were not willing to do. They wrote more papers to their principal Mr. Bridges asking permission to have the yard sale and to take a field trip to Petco to pick out and shop for the gecko. The students wrote, created and starred in a commercial advertising the yard sale (http://vimeo.com/113487691). They encouraged their parents to bring things in for the sale. The yard sale was held Dec. 5th. They gave up their recess time and eating lunch outside so they could collect money and keep track of how much they earned. They set a goal to raise one hundred and twenty five dollars, and finished the sale having raised about $400. A leopard gecko will soon be added to the class, and this hands- on learning project will continue as they care for this little animal. If you would like to create your classroom project in getting a classroom pet, be sure to visit our website, www.PetsintheClassroom.org, for information on classroom pets and to apply for our grant.